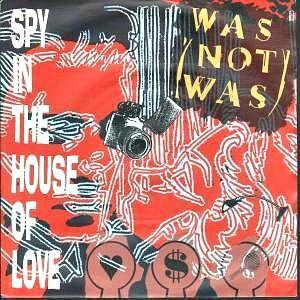 WAS (NOT WAS) "SPY IN THE HOUSE OF LOVE"
This funky number from the late 80's originally failed to chart in the UK, but following on from the success of their #10 hit single Walk the Dinosaur, Was (Not Was) re-issued the single in 1988 and it made #21 in the UK singles chart, and #7 on the U.S. Hot 100. It was taken from the album What Up, Dog? - see the album cover below. Only #21 in the charts? That's outrageous! I think this deserved to be at least a top ten hit as it knocks the socks off most of the rubbish released today. The American pop act was formed in 1979 by David and Don Was - the duo were childhood friends in the suburbs of Detroit. Don Was also produced music for other artists during the 80s, including the album Spolied Girl by Carly Simon in 1985, and also the B-52's 1989 album Cosmic Thing. He has since produced dozens of singles and albums, his most recent being the album Blessed for Lucinda Williams during 2011. Des Was has produced songs for 80s band ABC, the X Files movies and TV series and also for Bob Dylan and Roy Orbison to name but a few. He currently lives in California. Was (Not Was) reformed in 2004 and toured the U.S. during 2008. They also released an album entitled Boo! and performed on Later With Jools Holland in the same year. However, the album was not commercially successful. Incredibly, Boo! was the band's first album release for 18 years, their previous album being Are You Okay? This was released during the summer of 1990 and reached #35 in the UK album charts and #99 in America.